We start episode 3 in a typical Max fashion, with Dora chasing him down a hallway. 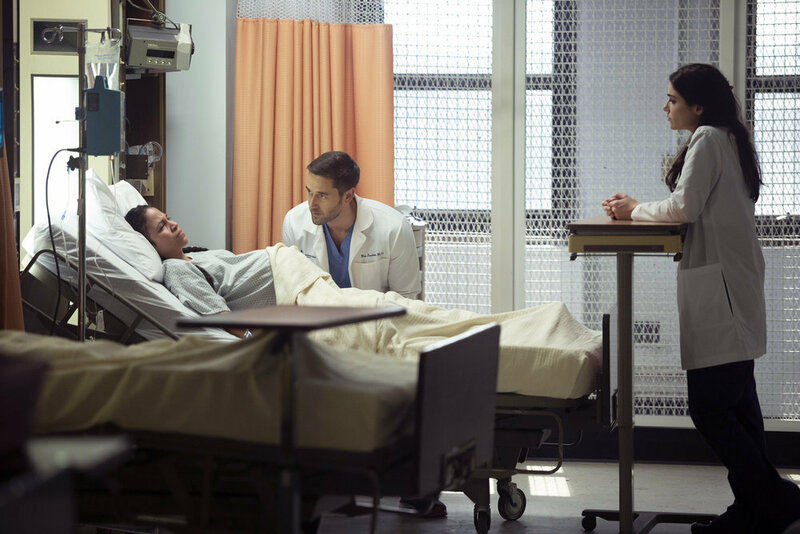 Max has been running away from the Dean of Medicine since he started at New Amsterdam and it looks like he’s about to catch up with him. Dora informs Max that the Dean is waiting in his office and there is no more running away from him. When Max finally makes his way into the office, the Dean tells him he is fired. Max’s response is exactly what you expect it to be when he simply says, “okay.” The Dean doesn’t understand how he can be so nonchalant with his answer. Max explains that a lot has happened in two months. Two months ago he lived with his wife and the country had health insurance. The Dean reminds him that he begged for this job and it sounds like he is having a nervous breakdown. Max assures him he is just trying to save the hospital. The Dean points out that is appears he is trying to do anything but save the hospital. Max has eliminated the cardiac surgery program which is the highest source of revenue the hospital produces. He’s hired 50 new attendings and seriously dampered the residency program. The Dean wants his changes implemented, not the changes the Max has made. Max points out that the Dean’s changes were not working and haven’t been working for 20 years. He reminds the Dean that he loves this hospital and thought that the Dean did as well. After a few minute conversation the Dean gives him six months to implement his changes successfully or he is fired. Max retorts that he should give him only 3 months and the challenge has been accepted. Max is once again caught in the crosshairs as Dora is asking him to sign paperwork for the rules he is changing while also reminding him he needs to head to the staff meeting in the opposite direction from which he is walking. Max advises the his wife is in the direction he is going when Dr. Sharpe interrupts to talk about his treatment plan. Max doesn’t want to talk about treatment plans, especially in a public hallway. Dr. Sharpe reminds him of everything that needs to be done before he starts treatment including molar extraction, PEG insertion, and IV ports. Max knows the drill and doesn’t want a doctor since he already is one. He wants someone to bounce ideas off of, be a guide or a sherpa. Max has to confess to Dr. Sharpe that he hasn’t told his wife yet since she is on bed rest but he will when she feels better. Dr. Sharpe is not on board with this plan but Max is moving forward, full steam ahead. When Max enters Georgia’s room, she informs him that she is being released today. Max isn’t prepared for this, believing it is too soon for her to leave the security of the hospital. Georgia has to remind him that most people don’t love spending time inside a hospital like he does. She also drops the bombshell that she is going to stay with her parents in Connecticut. Max is worried that he will never see her but Georgia doesn’t want to stay at the hospital, she wants to go home to where her mom can help her. 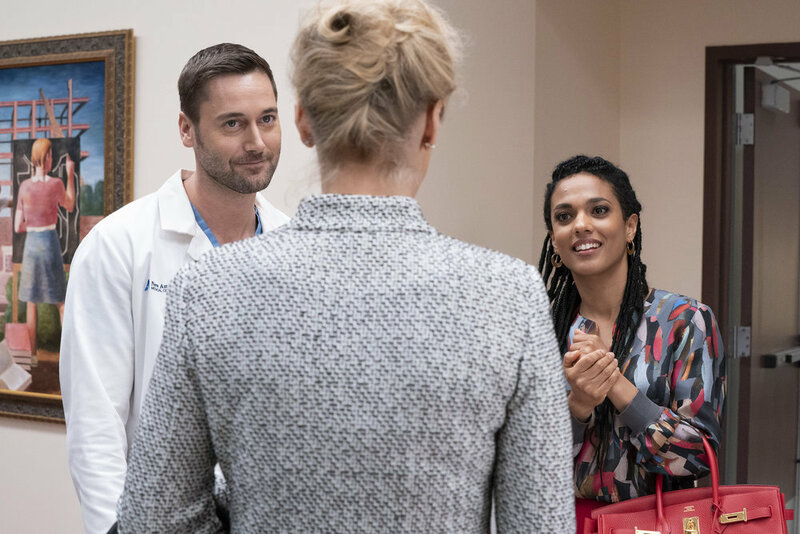 Max eagerly greets Mrs. Ryland (Laila Robins) when she enters the hospital and wants to introduce her to his departments heads. He is quick to banter with her in an attempt to win her over. The first department head Max introduces Mrs. Ryland to is Dr. Sharpe. 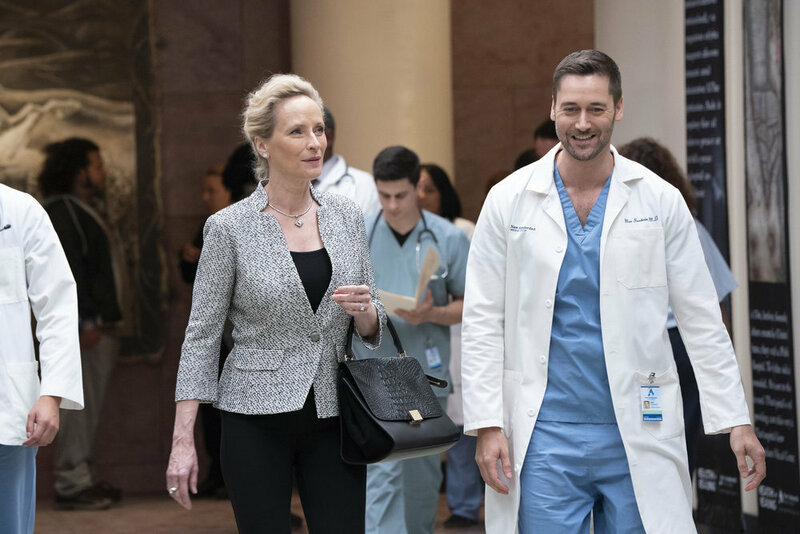 Their introduction does not go over well when Mrs. Ryland picks Dr. Sharpe over for her radiant smile while working in such a dreary department and the fact that she is walking around carrying an expensive designer handbag while it is so expensive to provide patient care. Mrs. Ryland explains to Max the circumstances around her husband’s previous visit to New Amsterdam when he had a heart attack. Max then introduces her to Dr. Reyonlds and explains that he is the new Chair of Cardiothoracic Surgery. Dr. Reynolds introduces his three new attendings, which all are African-American females, to Mrs. Ryland who seems to be at a loss for words. 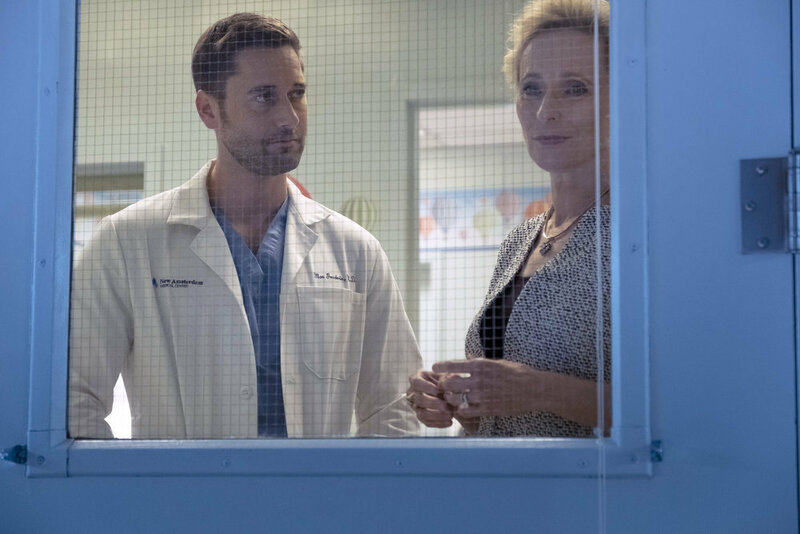 In an attempt to dig herself out of a hole, Mrs. Ryland asks for Dr. Merritt since he was the one that saved her husband’s life after his first heart attack. Max informs Mrs. Ryland that he no longer working at New Amsterdam and Dr. Reynolds adds that he was let go. Later in the episode Dr. Bloom comments to Dr. Reynolds that he is putting together quite the team. She jabs at him when she asks if there are any future wives in the mix. Dr. Reynolds informs her that less than 19% of surgeons are female and that the statistics for women of color are so minuscule that they don’t exist. He adds on that he intends to hire people of every ethnicity and gender for his staff but he is going to start by hiring women of color first. We first see Dr. Kapoor when he is distracted by his phone while ordering a pastry from the food cart. 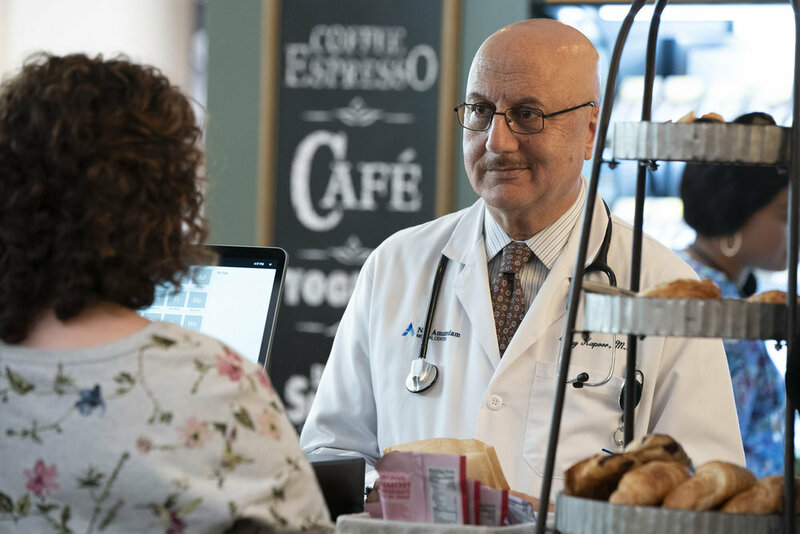 The cashier, Ella, asks if he missed an important call and Dr. Kapoor advises him that he is waiting on one that probably wouldn’t come. Ella comes to the conclusion that he has been ghosted. Ray’s Story. Our first patient story comes to us via an aerial view of a naked man digging at a gravesite as he cries out “Maddy, I’m sorry. I need to see you.” After a few moments of him digging at the grave, we hear sirens and see them light up the scene. He is brought into the ED at New Amsterdam where Dr. Bloom notices track marks and orders a toxicology screen. Dr. Frome is sent in to perform a psych evaluation on Ray (Matthew Maher). Ray advises that he didn’t want to get his clothes dirty and that is why he was naked while digging in the cemetery [Ed. Note: This just seems like good common sense]. When asked about Maddy, Ray informs Dr. Frome that she was his fiance and they were going to get married in a month and he is having a hard time dealing with losing her. Dr. Frome notices that Ray’s toxicology report came back clean but it is obvious that he has been injecting himself with something since he has track marks on his arm. Ray doesn’t know what arm he is talking about. Dr. Frome tests the feeling in his arms to which Ray advises he doesn’t feel anything. Ray doesn’t understand why he would feel anything since he is invisible. Dr. Frome brings Dr. Kapoor on the case because Ray can’t feel his arms. Dr. Frome doesn’t know exactly which direction to head since his toxicology reports came back negative and Ray thinks he’s invisible. When Dr. Frome brings Dr. Kapoor in to meet Ray, they discover he is no longer in the room. They don’t want to sound an alarm through the hospital since Mrs. Ryland is on campus taking a tour so they decide to only use the walkie system to alert the security of their missing patient while they frantically take off in search of him. While Max is showing Mrs. Ryland the psych ward, he notices a naked Ray trying to open a locked door. Max quickly takes Mrs. Ryland in the opposite direction so she doesn’t see the naked man on the loose. Dr. Frome is on the phone, presumably with security trying to track down Ray when Maddy, his fiance, shows up at the hospital. Dr. Frome is confused because he thought that she was dead according to information he gleaned from Ray. After talking with Maddy, Dr. Frome advises Dr. Kapoor that everything was fine between Ray and Maddy until a week ago when Ray suddenly disappeared. He stopped taking her calls and going to work. The only reason Maddy knew that he was at the hospital was because the police found his wallet and called her. Dr. Kapoor looked through Ray’s chart and noticed that one of his lab results had trace amounts of glutaraldehyde. He asks Dr. Frome if Ray actually ever said that Maddy was dead. Dr. Frome recalls that Ray was going on about her in past tense and that he lost her and he was found digging up a grave. Dr. Kapoor then advises that the common name for glutaraldehyde is embalming fluid. The lightbulb goes off for Dr. Frome as he realizes that Ray believes that he is dead, not his fiance. Dr. Frome believes he knows where to find Ray and is correct when they find him in the mortuary, laying inside a body box. Dr. Frome explains to Maddy that they believe Ray is suffering from something called Cotard’s Syndrome, where the patient actually believes they have passed on. Maddy is visibly upset that Ray thinks he is dead and doesn’t understand why he can’t feel his arms. Dr. Frome informs her that Dr. Kapoor is performing a MRI and they will know more once they have the results. His attempts to console her go a bit sideways though. The MRI shows that Ray has a brain tumor that is causing his delusions, out of body feelings, and numbness. The doctors explain to Maddy that they can reduce the swelling with steroids and with treatment, the brain tumor is treatable. We end Ray’s story with one of the most touching moments from his fiance. When Ray asks what the doctors said, she sweetly tells him that tomorrow they’re gonna bring him back to life. Janelle’s Story. Our second patient story takes us on a roller coaster of emotions. We start out with Dr. Bloom waiting for a patient to arrive from Rikers prison and prepping a bay for their arrival. She is taken aback when a young woman who is pretty far along in her pregnancy is wheeled into the department surrounded by guards. When Dr. Bloom examines the patient, Janelle (Raquel Dominguez ), she notices that her blood pressure is extremely high and might be developing a condition known as preeclampsia. Dr. Bloom will have to order more tests to confirm the diagnosis. When Dr. Bloom notices Janelle struggling against the restraints, she confronts the prison guard to remove the handcuffs. He refuses to have her unrestrained in an unsecured area. She argues that she will take responsibility and she needs them removed to keep Janelle’s blood pressure under control. The prison guard refuses to back down. Dr. Bloom is on her way out of the hospital at the end of her shift when a nurse advises her that Janelle’s arm is bruised from where they took her blood pressure and the protein in her urine is sky high. Dr. Bloom wants her tested for HELLPS and if it comes back positive … the baby will have to be delivered. She decides to stick around to keep an eye on Janelle. Later on, Dr. Bloom interrupts Max’s tour with Mrs. Ryland to get his assistance with Janelle. She has HELLPS syndrome which is now complicated by maternal seizures and they both will die if the baby is not delivered. However Janelle refuses to let them deliver her baby. Max is brought up to corrections to talk with Janelle. She doesn’t want to deliver her baby because she doesn’t want her daughter to go into foster care. Janelle doesn’t have any family or someone who could take care of her baby until she gets out of prison. She will be released in six weeks and wants them to do whatever they can to keep the baby inside her until she is released. Max promises Janelle that he will find a way to take care of both of them if she consents to the delivery. Max is calling the Mayor to pull strings for Janelle when he walks into his wife’s room. Georgia is dressed and getting ready to leave the hospital. She advises Max that he can come up to Connecticut every weekend if he wants. Max doesn’t want to go to Connecticut, he wants Georgia to stay here with him. Max knows he broke a lot of promises and he is trying not to break any more but Georgia has made the decision to move to Connecticut and she is firm in her decision. While walking through the hallways, Max is trying to make a case for Janelle to the mayor. He is unsuccessful when the mayor refuses to make an exception. Max comes across Mrs. Ryland as he ends his call. Mrs. Ryland shows him the plans for the new heart institute at University hospital that the Dean had drawn up. Mrs. Ryland asks Max why he fired Dr. Merritt to which Max responds that he only cared about money. She replied that her husband was the same way. She continues that the building that the Dean had drawn up was exactly what her husband would have wanted. Max then asks her what she wants. We cut to Dr. Bloom in the operating room attempting to console Janelle as a C-section is performed to deliver her baby. Janelle starts to freak out that her baby is already here and that Max hasn’t found a way for them to be together. Janelle refuses to take her baby because she’ll have to give her up and she can’t go through that. Max is outside a baby nursery talking to Mrs. Ryland when she informs him that she always wanted children but never had any. Her husband said he wanted kids as well but after they got married he changed his mind. She asks about a specific room in the nursery. Max explains that it is kangaroo care. Volunteers hold preemies by providing skin-to-skin contact. When Mrs. Ryland inquires about the babies Max comes up with a brilliant idea. Instead of the $10 million dollars going to University or New Amsterdam, she could donate the money somewhere else all together. In a meeting with the Dean of Medicine and Mrs. Ryland, Max explains that the money could go to Rikers Island, to provide incarcerated mothers the opportunity to be with their babies by providing a nursery and Kangaroo Care unit. Max goes on to explain that even though the facility wouldn’t be ready for weeks that they could start the program today with Janelle and her baby. Mrs. Ryland doesn’t believe this is where her husband would want the money to go but this is where she wants it to go. The Dean doesn’t seem convinced that this is the right decision but Max never backs down when he believes in something. Mrs. Ryland agrees with Max and decides the money is going to Rikers Island. 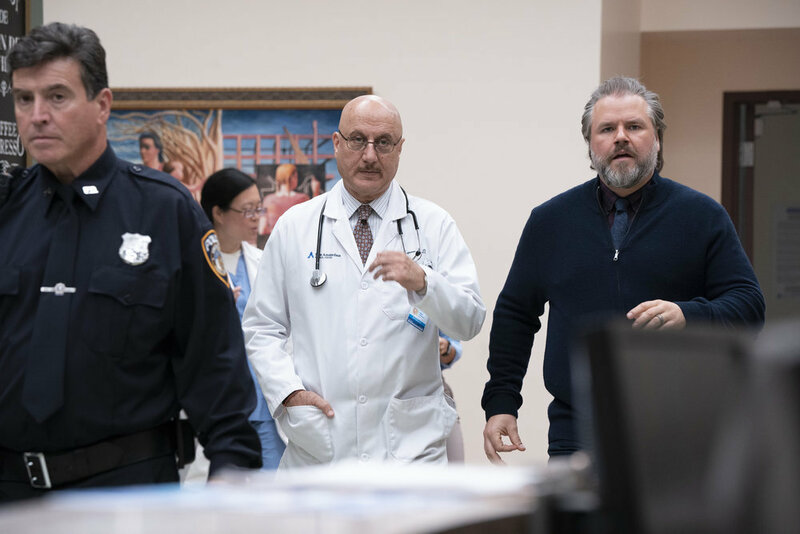 Dr. Bloom gets to share the good news with Janelle that her baby will be returning with her to Rikers. Anna’s Story. Dr. Sharpe is meeting with a patient, Anna, and her friend who wants to video capture their meeting since they are meeting with a lot of potential doctors and they want to make sure they remember everything. Dr. Sharpe is taken off guard when they ask what her qualifications are to practice medicine. The ladies are impressed with her qualifications and seem to come to an understanding of why it took three weeks for them to get an appointment. Dr. Sharpe apologizes for their wait and explains that she has some outside commitments but she will be cutting back on press. They decided they need to go elsewhere for medical care since they needed someone who will put Anna’s needs first and not the camera. Dr. Sharpe looks distraught that they didn’t think she would be a good enough doctor for Anna. Dr. Sharpe ends up running into Dr. Bloom in the elevator. Dr, Bloom attempts to give her a pep- talk, advising her that she is an excellent physician and that she raised a ton of money for the hospital. Dr. Sharpe counters that patients don’t care about that, they just want a doctor they can trust and right now she isn’t worth trusting. Dr. Bloom encourages her to tell them why they should trust her. At the end of the episode, when Max walks into Dr. Sharpe’s office, she is ready to confront him. She informs him that people wait weeks to make an appointment with her and that she is an extraordinary physician. Dr. Sharpe informs Max that if he doesn’t say that he needs her to be his doctor, that he is making a mistake that could cost him his life. Max interrupts her to say exactly that. Dr. Sharpe refuses to bargain with him on his treatment plan. Max agrees to do whatever she says and that he wants her to be his doctor. When Max asks how long he has before the chemo and radiation starts, Dr. Sharpe is strict on her 3 weeks out start date to which Max semi reluctantly agrees. Max takes off to see his wife before she leaves the hospital only to find that she has already been discharged. 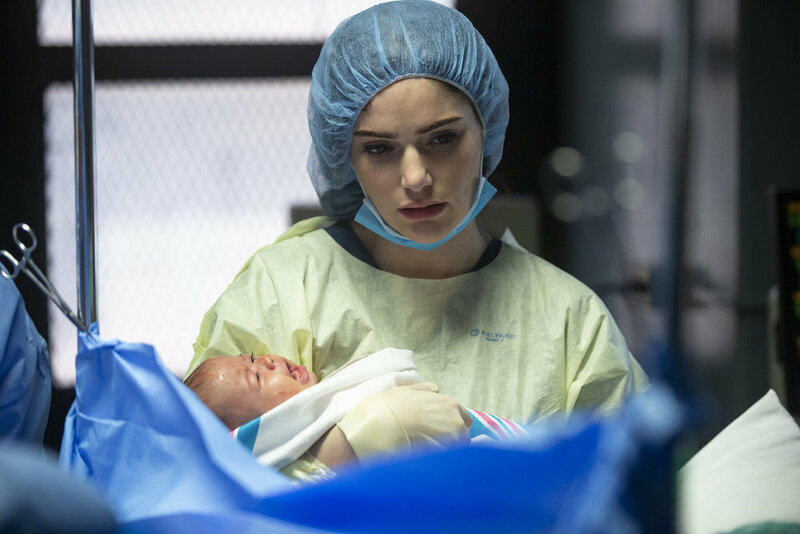 Max takes off in a mad sprint through the hospital in an attempt to see her before she leaves to Connecticut. After a several tense seconds of willing Max to run fast enough, we see him catch Georgia right before she is wheeled out the front doors. Max begs Georgia to stay here with him and not move away. Max pleads with Georgia to let him take care of her and their daughter, in his home. He is willing to drive her up to Connecticut himself if things do not work out but he just wants a chance to prove to her that he could do it. With tears welling up in her eyes, Georgia agrees to go home with him. In sheer excitement Max starts yelling through the lobby that he is going to be a father repeatedly as he wheels Georgia out of the hospital. I’m loving the growth and character development that we are seeing with the doctors of New Amsterdam. They all have stories that pull you along and leave you wanting to know more. I am constantly counting down the days until the next episode where I get a little further peek into their lives. I was relieved to find Max willing to fight the cancer instead of continuing to run from it. The last several minutes of the episode were an epiphany moment for Max and I hope he continues to grow and expound on it. I am now concerned on how he plans to take care of Georgia and the hospital while going through treatment. A person can only be Superman for so long before things start to crumble around you. I have a feeling things are going to be worse before they start getting better. We’re in for a bumpy ride.